Looking for private in-home or in-studio Drawing lessons? Our Dedham teachers are ready to get you started. Find your teacher today! Check out some of our most popular teachers near Dedham, MA including Boston, Cambridge, Brookline, Somerville and Lexington. one of my favorite things to do. from chalk to pencil drawing skills are essential skills that lend themselves to improving other skill such as sculpture and painting. I have got my bachelors in Art Education from Boise state University, where I also took classes or participated in Volleyball and baseball. I have been teaching art since 2006, mostly at the elementary level. one year at the middle school level. I love making things, specially for costumes as Halloween is one of my favorite times of the year. As a teacher I get to teach a little bit of everything and I also get to learn new things that I would like to try and learn as well as teach. I have been teaching basic stop motion animation with my students. I have also been airbrushing for 10 years, with my focus on painting t-shirts. -Painting realistic skin tones, composition,using a grisaille and verdaccio, glazing, methods and materials of the Old Masters, achieving a likeness in portraiture, accurate color mixing and matching, the use and preparation of painting mediums, translating what you see or envision onto the canvas successfully and much more. I enjoy teaching people that are passionate about art, regardless of their skill level. I am a classically trained artist and illustrator. I enjoy teaching people who are passionate about art regardless of skill level. I have exhibited widely in Mexico and the United States and also illustrated for magazines and books. -Painting Techniques such as Layering, Mixing, Washes, and Glazing. -How to Mix Paint: Mixing using the palette knife, brush, on palette, or on painting. I am a Grumbacher Art Certified Instructor. I am an experienced and accomplished artist; I specialize in encouraging students to explore their own creative style while also learning basic painting, drawing, and sculpting techniques. For children ages 4-11, I aim to focus on strengths, while building new skills. Drawing, painting, sculpting, collage, and printing are areas for exploration and growth. For older children and teens, I aim to focus on developing one's own style with continued exploration of art technique. I also have experience teaching painting an drawing to adults, inspiring them to discover their passion for art! I am flexible with my time and often give assignments or projects to work on after each session. earing from you and helping you or your children achieve creative success, strengthen existing talent, and develop new artistic skills! I understand and honor everyone has a unique way of approaching and looking at things...which doesn't mean I won't challenge you to try another way! Open medium and maybe we'll try some new ones to find your unique method. Zoe began her career as an artist at Walt Disney World in Orlando, FL. 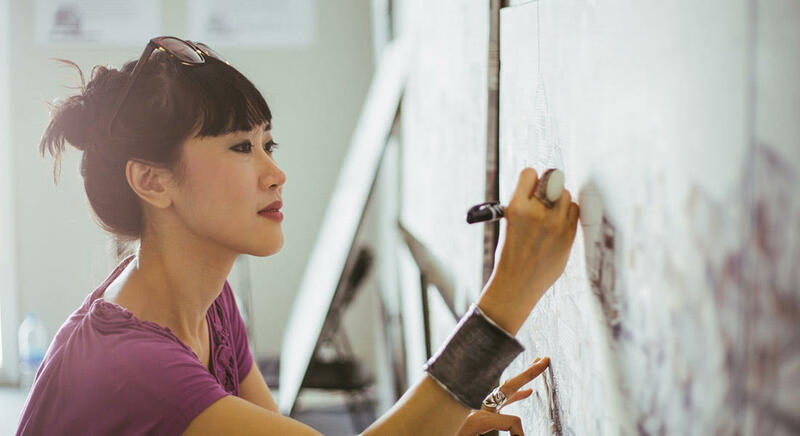 Bent on pursuing her career, she returned to Ohio to achieve her art Degree. Eventually, she found her way to Los Angeles, working in the dark side of Hollywood, as a storyboard and concept artist in indie horror on such films as the “Hatchet” movie series and “The Collector.” A diverse artist, Zoe spent 8 years designing collectibles and creating original souvenirs for such notable clients as Disney, Hard Rock Cafe and Sea World. She finds a strange balance between making cute Disney characters by day and planning out slashing people to bits by night. entions as a panelist and fun teacher of acrylics for a Friday night Paint and Wine. Currently, she has returned home to SoCal and building new and exciting ventures in the art world. She uses Illustrator and Photoshop nearly every day for the past 13 years along with her lifetime of skills as a traditional artist to accomplish a WIDE variety of tasks from more artistic to technical layouts. ...and you will have fun! I've been teaching for 3 years, and have had my work featured in galleries, universities, libraries, and more! I've taught one on one lessons, group classes and workshops to children, teens and adults. I specialize in landscapes myself, but can teach basic drawing techniques, perspective, lighting and shading, composition as well as theming, creating atmospheric and visually appealing scenes and environments, conceptual and creative thinking, and more! Feel free to message me with questions, and lets start drawing! I am a professional artist, specializing in pen and ink landscape drawings and illustrations. I graduated from SUNY Binghamton with a BA in studio art, concentration in drawing in 2014.
d shadow, shading, creating and fleshing out various objects and forms, and more! Lessons can be tailored to the interests of the student! If there's an area you are keen to focus on or improve, i'm happy to address and focus on it with you. Eli has been teaching my son (8) and he loves his drawing lessons! He helps teach techniques that we wanted to focus on and I have already seen an improvement. The lessons are fun while being instructive and Eli keeps my son engaged. Eli has been professional and has very good communication skills, we have had a great experience! My son had a great time and is excited about continuing. Eli is fantastic and has a great rapport with kids. He seems incredibly knowledgeable, very response, nice and funny, and currently teaches in an amazing artists space. He challenged my daughter outside of her normal comfort zone in a super fun way and she immediately asked for more lessons after the initial trial. Will definitely continue with more lessons. I have a Masters of Art education. I enjoy teaching students of all ages (kids, teens and adults) no matter what level of experience or ability. Not only do I teach drawing I’m skilled in Painting, Sculpture, and Mixed Media. All art lessons are designed around the student interests. Students learn at their own pace. I’m an outside the box thinker and utilize all my skills to provide a fun and engaging atmosphere to enlighten, and encourage my students. I tailor my lessons to each individual student, everybody learns differently and I can appreciate and accommodate for that. I love being an artist and teacher and I think with the right guidance art can be enlightening, enriching, and entertaining. I want to help you achieve your artistic goals, and unleash the true artistic potential you have. Experienced drawing teacher of many years, specializing in beginner and intermediate traditional drawing. All ages are welcome! Lessons are customized and catered to the needs/goals of each student. I can teach a more traditional drawing route or help you discover your own personal style for those more developed! Send me a message and let's create some beautiful works of art! Hi everyone! My name is Tori and I am professional artist / illustrator from Brooklyn, New York. I attended Pratt Institute as an Illustration Major in the Communication Department. Students can expect to improve week to week in their artistic abilities. I will offer insight and tips on how to draw more quickly and efficiently. Everyone starts off at a different pace, but progress is guaranteed! I have taught art to a variety of ages from 5 up to adults. My lessons combine a variety of techniques, depending on what you want to focus on. Whether it be technical skills or learning how become more expressive through your work, my lessons will incorporate my own drawing secrets with nothing held back. I highly encourage to view the work on my website by visiting brendanlehman.com and look forward to working with you soon. Hello! My name is Brendan Lehman and I'm an Oil Painter, Artist, and Illustrator. I love teaching and will do my best to teach you whatever you'd like to know. The only thing I ask that you bring is your passion for painting. As long as you have that, I have no problem teaching anyone at any skill level. Hello! I am an elementary art teacher certified to teach k - 12 art. Most people think you have to be talented to be an artist, but anyone can learn the basic skills of drawing! Hello! I’m an elementary art teacher certified to teach art to k-12 students. I also have a BFA in visual art studies. I am open to teaching any one that is interested in art starting at 8 years old. I am looking forward to helping you achieve your goals in art. I have experience drawing, painting, printmaking, bookmaking, making ceramics, and much more. I have a small home studio space to teach out of or I’d be happy to come to your home as well. There are also many places in San Antonio to meet and teach. Can't find a teacher in Dedham, MA? Students are raving about their Drawing instructors on TakeLessons. Check out some of these recent reviews. "My son had a great time and is excited about continuing." Boston, MA teacher: Eli P.
artists space. He challenged my daughter outside of her normal comfort zone in a super fun way and she immediately asked for more lessons after the initial trial. Will definitely continue with more lessons." "Kimaya's first class went great! Eddie was very calm and knowledgeable and my dughter loved him"
Boston, MA teacher: Eddie B.